Looking to learn more about best practices when it comes to ensuring academic integrity? You’re in luck! Whether you want to prevent plagiarism, model good research practices, or even find some tools for teaching ethics, you’ll find plenty of help at College of DuPage this summer. COD Testing Services, the Learning Commons, and the Academic Integrity Committee invite you to attend the 8th Annual Responsible Conduct of Research and Academic Integrity conference. Conference sessions will apply to a broad disciplinary audience. Interactive sessions with active audience participation will address Responsible Conduct of Research, Research Ethics, Academic Integrity, Academic Misconduct in Research, and Ethical Conduct of Researchers. You can register in advance or at the door the day of the conference. What are the top security issues in classroom testing and what can you do to prevent cheating on tests and exams? How do you define, discuss, and deal with plagiarism in your classes? This webinar will explore student motivations for plagiarism present best practices for supporting student academic integrity. What assignment characteristics lend themselves to plagiarism? Learn what they are and how to avoid them. 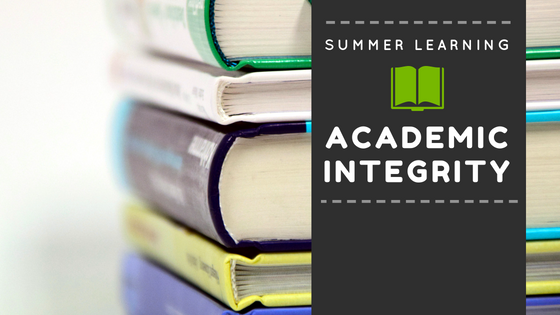 Prepare for the fall semester by building integrity into your classroom culture – whether you’re teaching online or face-to-face. In this session, we’ll discuss honor codes, definitions of cheating, and keys to creating a culture of honesty, integrity and accountability. If you can’t swing a noon session, the webinars will be recorded and available to watch at a time that suits your schedule.